This absolute ocean-front corner unit is perfect for your special romantic occasions; however, it will sleep four to five. 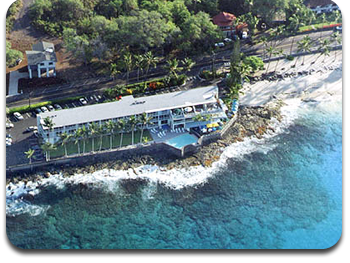 Privacy, security & sunset views are all yours for your vacation on the Big Island of Hawaii. The unit has a fully equipped view oriented kitchen, living room, and a lanai with sliding glass doors that open to the ocean - where Whales, Dolphins, Green Turtles and a myriad of colorful fish can be seen most days. The bath has a spa-tub & shower. Floor-to-ceiling mirrors invite the outside in, creating a spectacular indoor environment. RATES: All rates listed for single or double occupancy. Each additional occupant $25.00 per night. Maximum occupancy: 4 persons. A one-time cleaning/maintenance fee of $95.00 will be made. Half-day arrangements must be made at the time of registration. NOTE: Major holidays and special events rates are 10% higher and require a minimum 7 night stay. First time to the Big Island and what an Island! It’s so relaxing with amazing ocean views, nightly sunsets and the sounds of the crashing waves. So many things to do and places to see, without the Big City feeling. Can’t believe how Kona can have the same temperatures within a few degrees all year round and very little rainfall! The Magic Sands Beach right next door was an awesome beach to relax and enjoy when not exploring the island. Can’t wait until next visit! My husband surprised me with a trip to Hawaii with 3 gal pals for my birthday for a week. Even with 4 of us there was ample space between the bed, pullout and cot. The condo was bright and welcoming and the photos are exactly as it is. We were hard pressed to decide each day to either go to the private pool, magic sands beach, or wonder the park on the other side of the condo. We watched 3 to 4 turtles playing in the surf from the window and the sunsets were amazing. One of the nicest aspects of this condo being a 3rd floor corner unit is that you can open ALL the windows and let that warm breeze and the sound of the waves fill you. There is even a local bus that stops outside the condo and delivers you to town in case you just want to leave the car parked. Close enough to everything but far away enough to be quiet and private. The condo was clean and well equipped and the building was well cared for. There is even a lovely restaurant downstairs that was always well attended we never heard any diner sounds from the outside dining area. Highly recommended, well done! We stayed in this unit for a week at the end of January 2012. It was perfect for two people, although you could sleep one or two more if you had to. We were able to be away from the traffic and noise of town while only having to drive a few minutes to get to the stores and restaurants. The condo had everything we needed as well as a few nice "extras" like a picnic cooler, boogie boards and snorkeling gear. The open feeling of the condo made it seem even bigger than it is, and the ocean views were fabulous! The fact that the kitchen/dining area and the living room/sleeping area had a wall between them was really nice since my husband is an early riser but I'm not. So he could enjoy his coffee, newspaper, and the view in the morning without waking me. We saw both spinner dolphin and whales from the wall to wall glass sliders across the front of the unit, as well as sea turtles at the little park that the kitchen overlooked at the side of the condo. As you sat in the living area and watched the ocean you could see lots of colorful fish riding in the waves as they neared shore. The pool area was nice and never crowded. The complex itself was right off of Allii Drive but we were never bothered by traffic noises, and although the nice little beach park next door always had at least a few people in it there was never any obvious noise coming from there either. We didn't have a single complaint about this place except that the vacuum cleaner was hard to use and didn't pick up as well as it should have. Either a different vacuum or written directions on how to use this "unusual" model vacuum would be helpful. All in all our stay in this condo was great and we would recommend it to anyone as well as come back for another stay ourselves. What a great place to stay! I thoroughly recommend your place. It had all the amenities and then some. The huge surf just outside the window was totally amazing, something i have never quite seen along with stunning sunsets each evening! The location is perfect, looking out over quiet park and other side a very fun for all ages beach. Would recommend for all a full one piece suit as those waves can catch you off guard! This was such a memorable stay, would love to return to same unit. Look forward to new restaurant opening in resort. Two thumbs up! Every morning my wife and 2 sons started our day at the sandy beach for some boarding and swimming with the turtles. We finished every day with quiet time at the pool, the odd BBQ and watching the beautiful sunset. Exactly what a vacation is all about, Relaxing. It is a beautiful corner unit feet from the ocean where you can see the fish and turtles on a daily basis and the odd dolphin without leaving the comforts of the unit. The crashing of the waves put you to sleep after another tough day in Hawaii! 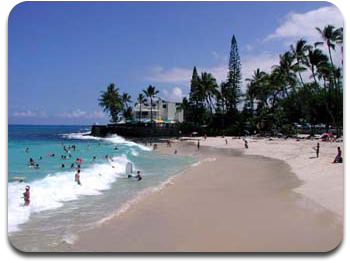 We will be back with memories never forgotten from our Hawaii 2010 vacation at Kona Magic Sands, THANKS!